But there is little evidence of belt-tightening in Washington. While the rest of the country switches into austerity mode, there's almost a boomtown feel in the capital, where a federal spending spree is rapidly driving the federal deficit to record heights. For the fiscal year ending Sept. 30, the gap between revenue collected by the government vs. what it spent was already lofty at $455 billion  an amount equal to nearly 7% of GDP, making it the largest deficit since the end of World War II. And the red ink will continue to rise, thanks to panicky raids of federal coffers by policymakers trying to stem the financial crisis. 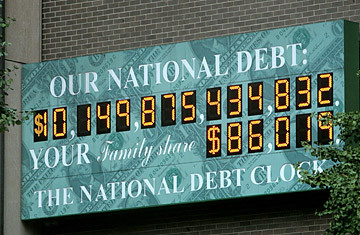 President George W. Bush started the current bonanza in February by approving a $152 billion economic stimulus package. When other bailouts, including the recently passed $700 billion financial rescue plan, are counted, Washington is set to shell out some $1.5 trillion in the near term. Projections for the next fiscal year's deficit start at roughly $550 billion and go as high as $1 trillion, depending on the government's current obligations, expected further spending measures and falling tax revenues related to the slowing economy. Rather than causing alarm, though, the rising deficit is viewed by policymakers and economists as a necessary evil to keep the economy afloat. "There is a real threat of a serious recession," says Robert Bixby, head of the Concord Coalition, an organization dedicated to eliminating deficits and shoring up the federal budget. "So it's appropriate in those circumstances to loosen fiscal policy, so long as it is done on a targeted and temporary basis." At some point, most economists argue, the U.S. will have to balance its budget and repay what it has borrowed to fund the spending spree. That will most likely mean reducing outlays and raising taxes in the future. But neither presidential candidate can convincingly argue that a balanced budget is possible in the next few years. Both are advocating economic programs that will probably increase the deficit even more. Republican candidate John McCain is calling for some $52 billion in economic recovery spending, while Democratic candidate Barack Obama's plan would cost roughly $175 billion. Both McCain and Obama have vowed to cut taxes, which is likely to drive the deficit higher.